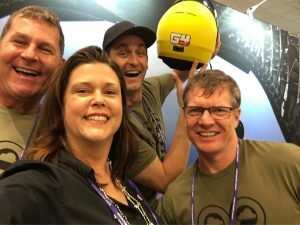 Cookie Helmets created quite the buzz in the skydiving world when they unveiled the G4 Full Face Skydiving Helmet on Feb. 4 at the 2019 Parachute Industry Association Symposium. The G4 is the next step up in the full face helmet progression that started with the GAS back in 2007 as a solid, easy-to-use carbon fiber full face helmet with a visor that didn't flip-up. That soon progressed to Cookie's first flip-up visor full face helmet with the G2 in 2009, also made of carbon fiber. But it really was the G3 in 2011 that radically changed the skydiving helmet scene as Cookie was able to produce the helmet on a larger scale, in more colors and with a consistent production standard due to a switch to the ABS material shell. The G3 has become the worldwide standard for not only experienced skydivers, but also new skydivers and wind tunnel flyers due the reliability of the opening mechanism, the quality of the construction and the availability of the helmets and parts all over the skydiving world. Fresh from Dakine and available at ChutingStar is a new Gear Backpack/Duffle Combo that we think is an awesome gear bag for weekend trips to the drop zone. The Dakine 90L Ranger Duffle Gear Backpack will hold just about any size rig along with your jumpsuit, accessories and helmet. It can be carried like a duffle bag, worn as backpack or carried like a gear bag.